Discussion in 'Effects, Pedals, Strings & Things' started by capt4inslow, Feb 26, 2012. Red Llama Mk. II or Les Lius or neither? As the thread title goes...thoughts? Below is my board currently. 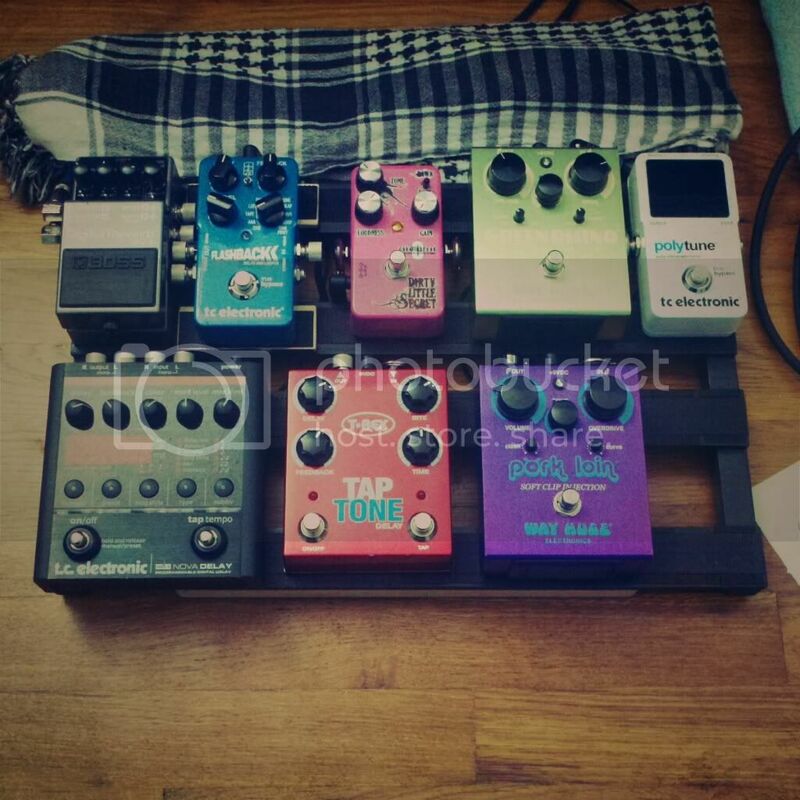 I just sold the DLS, so I'm looking to fill up that spot with a "different" dirt pedal. I've got the low/gain punchy boost covered with the Pork Loin, the TS with the Green Rhino, and my initial impulse was the Red Llama Mk. II, but there are a few Les Lius pedals going for reasonable prices on the emporium, and the samples I've heard of the pedal I quite like. Thoughts? Alternatives? In favor/against either/or? Can't help you with the reissue RL but when I compared my RL clone with the Les Lius the RL had more clarity in the midrange and the lack of a level control on LL severly limits it's usefulness. From what I've read the RL reissue is said to be smoother than the clones. It would be my choice hands down. Looks like you need a delay. Aqua Puss No. 2 and call it a day? No love for the Les Lius? I have both, and I use the Les Lius more than the Red Llama. The Les Lius does in fact have a volume control (the knob on the left) which controls overall volume of gain stage 1 and gain stage 2. Plus, you have the option of kicking in gain stage 2 for solos. The gain amount is fixed for gain stage 1, that's true, but I find that setting to be highly useful for good crunchy rhythm parts. And the gain amount for stage 2 is adjustable via the knob on the right hand side. Essentially, The Les Lius offers 3 settings: clean rhythm (unit off), crunch rhythm (gain stage 1) and solo (gain stage 2). What more do you need? If you had to get by with one pedal, it would do the job nicely. Also, you should have no trouble finding one as they are again in regular production, check the Lovepedal site. In addition to the above there is also the toggle sw. which gives you a tweed Deluxe cranked, a tweed Twin or a combination of the two. I think it's a very versatile pedal. I admit to having no experience with the Red Llama. I own both. Red Llama all the way. My RL MkII is on my board now - my LL sits unused. LL is super bright and thin compared to the Llama. And it loves the GR MkII by the way. The poll isn't helping the Les Lius either, wow. Maxed out, the Les Lius does a ridiculously good Neil Young/tweed tone, which would be way different from your other 2 dirts. I'm not sure of how exactly you're looking to use it tho. Looks like you really like the WH stuff tho, so you should probably start there. I've been listening to a lot of newer Stones (live), and knowing that Keith uses an old school Twin (and Ronnie those stacks of Super Reverbs), I've been looking at the Les Lius for those tones. I'm a fan of the Way Huge stuff and their website does advertise the Red Llama as an "old boutique amp" type of tone, and technically it would be "more versatile" than going with the Les Lius (in theory). I was in the room the first time Keith's main Twin got the stock Alnicos swapped out for Celestion V30s, and spent some time in front and behind it in decades since. So far, the Les Lius is closest I've heard of "that" tone. i got my red llama brand new from sam ash for $89. I just found some simple coupons, called them up and asked what the best price they could do. $89 was the response. Bought it. I have owned several over the years and I love it. I also own a D13 Cj11 which is a tweed deluxe on steroids. I believe the llama does a fine job at miming that tone. at least a 9/10. So for me its a simple decision. I love way huge. Someone said the Les Lius sounded 'too bright', did i read that correctly? Well, then, there's something wrong with that particular LL or it's somehow placed somewhere in a signal chain which is causing problems. The Les Lius is NOT a bright pedal, it's quite warm. Also, as someone else mentioned, it has the 3-way toggle for even more sounds. Frankly, I don't think there's any question about it, the Les Lius is the wiser choice. And this is coming from someone who owns both, not just a biased fan of either manufacturer. bgoez Stratocasters are my downfall! I have a les Lius that I'm going to move because it didn't bond well with all my amps. It really likes my Dual Professional and twin amps. But for some strange reason it really doesn't sound so good with my Deluxe or Bassman amps. Even when the amps are set completely clean. It's a one trick pony pedal, but it sure is a neat trick. I'm simply trying to shrink my pedalboard so off it goes. I hope this helps. Does 6 tricks, (as opposed to endless variations) but as the man said, "That's the trick!" The Formula 5's fun too, edging more to "amp in a box" (plug it into a radio and it sounds 5E3-ish!). That said, I've kept both.